The Transfiguration – it must have been a most amazing experience. To spend three years with the Lord as a disciple must have been something in itself, but with the Transfiguration, Peter, James and John had a glimpse into Christ’s glory as God. “Master, it is wonderful for us to be here.” Can we blame St Peter for wanting to stay on the mountain and not wanting to go back down to ordinary life below? On 21st August 1879, in Knock, County Mayo, Ireland, the local people were surprised by an unusual sight: the figures of Our Lady, St Joseph and St John the Evangelist appeared outside the local parish church, together with an altar, on which there was a Lamb, which was perhaps between five and eight weeks old. Our Lady appeared to be life-size, with a large crown on her head and her hands raised in prayer; St Joseph’s head was bent, as if paying his respects; and St John was dressed like a bishop, with a small mitre on his head. He had either a Mass book or a Book of the Gospels in his left hand, whilst his right hand was raised as if he was preaching. This sight was seen by various witnesses in the pouring rain, and people stayed there for between fifteen minutes and an hour and a half, observing the apparition, praying, wondering what it was, and what it meant. Fifteen people went on to make official testimonies, who ranged in age from five years to seventy-four, and the Church found that the testimonies were both trustworthy and satisfactory. Knock is now one of the major pilgrimage sites in Ireland, and if you look at the statues there based on the apparition, Our Lady, St Joseph and St John are over to the left-hand side, because it is the Lamb on the altar who takes centre stage, complete with the angels gathered around the Lamb and a cross behind the altar. Just think what it must have been like to have witnessed that apparition. Then imagine what it must have been like to have been with Christ on the mountain of the Transfiguration – the Father spoke, the Son was revealed in His glory, and the Holy Spirit was present in the cloud. Could you think of anything more wonderful? But God has not left us alone. Back in 1968, Pope, now Saint, Paul VI concluded the Year of Faith by issuing the Credo of the People of God. It was a statement of what we believe as Catholics, much longer than the Nicene Creed we recite at Mass, designed to correct certain errors that were creeping into people’s minds with regard to what we are supposed to believe. Towards the end of it, it speaks about transubstantiation and Christ’s continuing presence in the tabernacle. The Pope described it wonderfully: he said that the Blessed Sacrament in the tabernacle is the “living heart of each of our churches. And it is our very sweet duty to honour and adore in the blessed Host which our eyes see, the Incarnate Word whom they cannot see, and who, without leaving heaven, is made present before us” (para 26). In a sense, the apparition at Knock is making a similar point. Christ, the Lamb of God, is on the altar, with the angels encircling Him in adoration. St Joseph has his head bowed in deep respect. Our Lady has her eyes and hands raised to heaven in prayer. And what is St John preaching? He is holding a book, whilst also referring to the altar: perhaps we could pick a verse from the first chapter of his Gospel: “The Word was made flesh, he lived among us, and we saw his glory, the glory that is his as the only Son of the Father, full of grace and truth” (John 1:14). St John saw Christ’s glory when He was transfigured. Often, when we have Eucharistic adoration, the host is placed in a monstrance. The word “monstrance” comes from the Latin word monstrare, which means “to show”. It’s where we get words like demonstrate. The monstrance is like an elaborate display-stand for the host, and often, at the very centre of the monstrance, where the host is placed, there are what look like rays of the sun emanating from the host. We cannot see Christ’s glory – we need the eyes of faith for that. But just as He was transfigured on the mountain, and as He was adored at Knock by the saints and angels, today, Christ in the Blessed Sacrament, radiates His love, holiness and graces upon us. Another point: it says in today’s Gospel, “And after the voice had spoken, Jesus was found alone”. Sometimes, we can have a very intense and spiritual experience when praying before the Blessed Sacrament. But there does come a time when we have to return back to our daily lives. 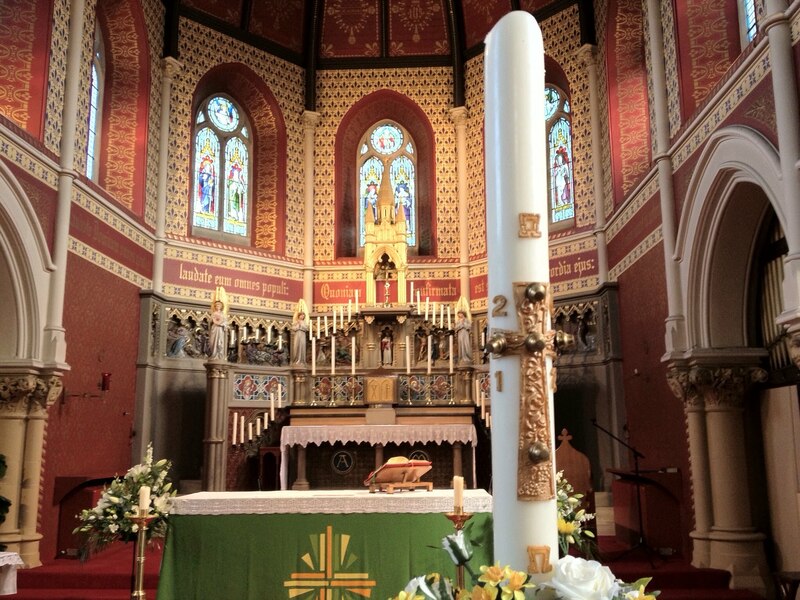 Just like with Peter, James and John, our experience of Christ in the Blessed Sacrament transforms us, which then helps us to bear witness to Christ, crucified and risen, in our daily lives. Sometimes, though, in our prayer time, we may not feel like we have experienced anything special. It may have seemed all fairly mundane. But we know that whichever experience we have had, Christ is still there, present. What if one day we walked into church and saw an apparition similar to the one in Knock? Would it change the way we behave before Mass? This Lent, let’s rediscover our appreciation for what Christ has given us, a presence that can transform us, but only if we let Him.